Known for her musical creativity and electrifying stage presence, pianist Jade Simmons is committed to expanding the boundaries of Classical music. Though her affinity is for the rhythmic and percussive repertoire of 20th and 21st century composers, Jade offers a diverse mix of repertoire from the classics to the cutting edge. In 2006, she became the first ever New Music, New PlacesFellow for the esteemed Concert Artists Guild organization. Under this initiative, she helps to build new audiences and generate interest in concert music by bringing traditional and new works to non-traditional and alternative venues. A passionate arts advocate, Jade served as the inaugural host for the Van Cliburn Internatinal Piano Competition’s live webcast in 2009. The competition, held every four years, is a joyous festival dedicated to the discovery of the world’s finest young pianists. In 2007-2008, her notable performances included New York’s Symphony Space, on the Ravinia Rising Stars Series and in Symphony Hall with the Chicago Sinfonietta. Highlights of the current season include debuts in Seattle’s Meany Hall, Detroit’s Institute of the Arts, Washington D.C.’s National Academy of Sciences and at Town Hall and Merkin Hall in New York. 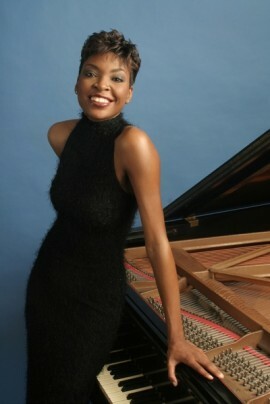 Her performance of the piano works of Tania León alongside renowned pianist Ursula Oppens was named one of the Best Concerts in 2005 byArtForum magazine. June 2005 also marked her debut with the Dallas Symphony Orchestra in a performance of John Corigliano’s Piano Concerto under the baton of Leslie Dunner. Jade has performed as soloist, recitalist and chamber musician and her performances have been broadcast by Public Broadcasting Service and National Public Radio affiliates. She has performed abroad in Barcelona, the Canary Islands, Paris, Greece and Italy. Her debut record for E1 Music (formerly Koch Records) featuring American works for piano, past and present, was released on March 24, 2009. Not only a pianist but also a youth advocacy speaker, Jade is sought after by audiences across the United States. As founder of the Where Do You Stand?! speaking series, she has appeared on a variety of radio and television programs where she has spoken on topics ranging from the arts to youth suicide prevention. As an advocate for the arts in education, she created a presentation entitled Mozart on the Move for elementary school students. Now in its third season, Jade founded The Impulse Artist Series for uniquely talented, emerging pianists. As a result of these endeavors, Jade was named as one of Ebony magazine’s 2007 Young Leaders under 30. A true renaissance woman, Jade designs her own concert wear and writes articles on the arts. Winner of numerous awards and scholarships, Jade was Miss Illinois and first runner-up at the 2000 Miss America Pageant where she performed Chopin’s Étude Op .10, No. 4, in C-sharp minor live and before a television audience of millions. A native of Charleston, South Carolina, and a graduate of Rice University’s prestigious Shepherd School of Music, Jade received her Master of Piano Performance degree as a Provost Fellow under the tutelage of concert pianist Jon Kimura Parker. In 2001, she completed her undergraduate work at Northwestern University studying with Dr. Sylvia Wang. While at Northwestern, Jade co-founded the popular percussion and dance ensemble Boomshaka! and integrates percussion into her current performance activities. Joining forces with two former Boomshaka friends, Jonathan Sanford (saxophone) and David Skidmore (percussion), Jade formed the Collide Trio which performs a hybrid mash up of hip-hop, electronica and art music bound together by the creative minds of three classically-trained musicians. She maintains an Internet presence at www.jademedia.org.